Always on the lookout for the perfect daytime mascara, I've tried pretty much every one on the market. I'm not a fan of "going out" lashes in the daytime -- I don't need them to be so long they hit my glasses or so thick I look like I'm wearing falsies. And you'd be surprised just how tough it is to discover that elusive lash lengthener. At least I thought so until I came across Bobbi Brown Perfectly Defined Mascara. This unassuming little black tube packs a major punch. The formula literally lengthens and separates lashes just the right amount with just a tiny sweep! The brush somehow manages not to come out of the tube without a single clump ... and it really applies like a dream. No flaking, no smudging, no running of any kind. And wow do lashes look absolutely incredible! Ever since I started wearing this mascara, my daytime look has totally felt like it was turned up a notch. 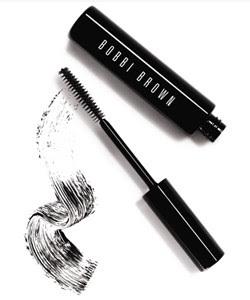 Have you tried Bobbi Brown Perfectly Defined Mascara? Do you love it or were you left wanting more? Let me know in the comments!